I have not had the chance to read any of the works by Marieke and now I am hating myself more and more for waiting. I was not sure what to expect going into this book but after repeatedly being told that her books are amazing, I could not wait. In the story we follow two characters but there is a twist...one is dead. 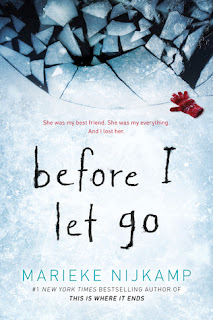 Corey is just days from coming home when she gets the news that her best friend is dead. Traveling back to a town full of unwelcoming behaviors and selects, Corey will find out that there is a lot more behind the death of her friend and that some secrets are meant to stay buried. I do have to say that I was told that this book is a thriller and oh boy is this book a thriller. Close to the end my heart was racing, the hair on my arms were standing and I was on the edge of my seat yelling 'Run!' (Once you read it you will understand). The story was hauntingly written, switching back from past and present and ever so now mixing in letters adding to the stories beautifulness. Throughout the reading I felt I was standing right there the entire time and could picture crystal scene every scene and every facial expression and the words hit me with pure, raw emotion. Nijkamp writes a story that will leave you wanting more while also satisfying your curious mind. 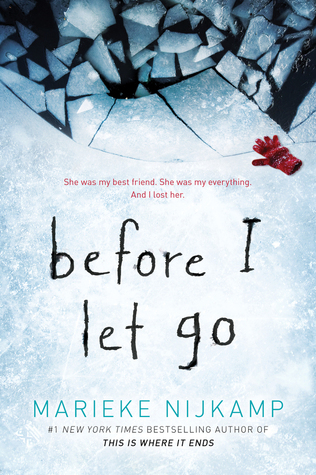 Before I let Go is the perfect winter read for those that look past the jolliness of the holidays and look into the shadows. A story of understanding, of loneliness comes a masterpiece that will be sure to leave a lasting mark on those who venture in Lost. Nijkamp work is pure brilliance.